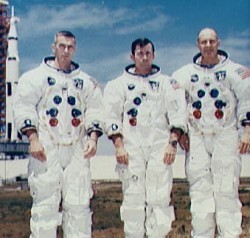 The astronauts returned to Earth on 26 May. 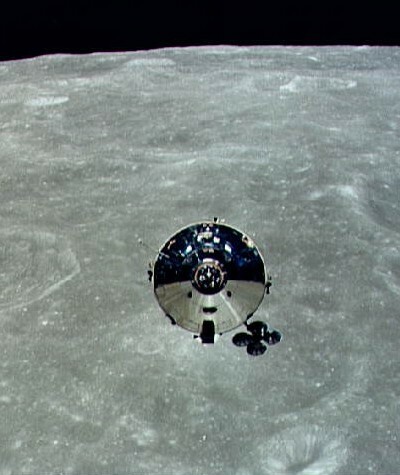 This spacecraft was the second Apollo mission to orbit the Moon, and the first to travel to the Moon with the full Apollo spacecraft, consisting of the Command and Service Module (CSM-106, "Charlie Brown") and the Lunar Module (LM-4, "Snoopy"). The primary objectives of the mission were to demonstrate crew, space vehicle, and mission support facilities during a manned lunar mission and to evaluate LM performance in cislunar and lunar environment. The mission was a full "dry run" for the Apollo 11 mission, in which all operations except the actual lunar landing were performed. The flight carried a three man crew: Commander Thomas P. Stafford, Command Module (CM) Pilot John W. Young, and Lunar Module (LM) Pilot Eugene A. Cernan. 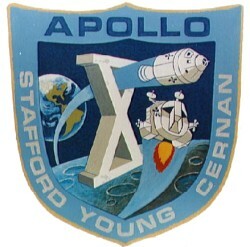 On 22 May Stafford and Cernan entered the LM and fired the SM reaction control thrusters to separate the LM from the CSM. The LM was put into an orbit to allow low altitude passes over the lunar surface, the closest approach bringing it to within 14 km of the Moon. All systems on the LM were tested during the separation including communications, propulsion, attitude control, and radar. Numerous close-up photographs of the Moon's surface, in particular the planned Apollo landing sites, were taken. The LM descent stage was jettisoned into lunar orbit. The LM and CSM rendezvous and redocking occurred 8 hours after separation early on 23 May.